Contact me about the services and products I can provide you for your special day. Photo Albums, Enhanced/Edited Photos, DVD Presentations are shown above. This is the Tweedy WeddingThe wedding and party were held outdoors in Columbus, Ohio on September 16, 2017. This is the Hunter Wedding. The wedding ceremony was held at St. Margaret of Cortona Catholic Church in Columbus, Ohio on July 16, 2016 and the reception dinner was held at the Golden Corral. This is Saraa & Abdul's Wedding. 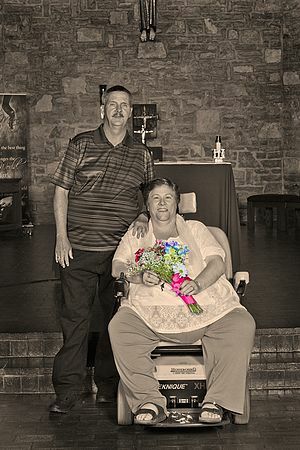 The wedding ceremony and reception was held May 22, 2015 at the McCoy Center in Hilliard, Ohio. This is the Atkinson Wedding. The wedding ceremony and reception were held in Mt. Gilead, Ohio June 9, 2012. This is the Collura Wedding. The wedding ceremony was held at St. Leo's Catholic Church in Columbus, Ohio on August 2, 2008 and the reception was held at the Buckeye Hall of Fame Cafe in Columbus, Ohio. This is the Uche Wedding. This was a beautiful African wedding. This is the Helser Wedding. The wedding ceremony was held at St. Paul's Lutheran Church in Ashville, Ohio on October 18, 2008 and the reception was held at Cheer's Chalet in Lancaster, Ohio. This is the Taylor Wedding. The wedding ceremony and reception were held at the Columbus Athenaeum on August 4, 2007. This is the Bailey Wedding. The wedding ceremony and reception were held at Lake Stephens in Beckley, WV on November 11, 2011.